Other guest speakers included Stephen Perry, chairman of Britain's 48 Group Club, Professor Martin Albrow, the honorary vice-president of the British Sociological Association, renowned scholar Martin Jacques, and Fang Wenjian, chairman of China Chamber of Commerce in the UK. Liu explained how the thought has provided the best answer for how a richer and stronger China will behave and how it will influence the world. The core of the thought, said Liu, is that "it inherits and develops China's cultural and diplomatic tradition; it encapsulates the concepts and practice of China's diplomacy; and it provides an assessment and definition on the development of the world and the role of China. 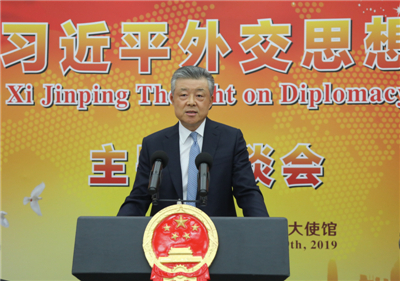 "In the past 70 years, we have formed the diplomatic tradition with unique Chinese features, namely, independence, peaceful development and win-win cooperation," he added. But China's hard work over the past decades has not only brought about a better life for its more than 1.3 billion people. As Liu noted, it is also an important contribution to peace and prosperity in the world and the common interests and benefits of people of all countries. For the whole world, Liu believed that the thought draws a new blueprint for human progress and explores a new thinking on international relations, as well as providing a new guideline for global governance. "The thought is aimed at safeguarding and improving the international order rather than replacing the existing system. It is also aimed at common development, rather than interfering in the affairs of other countries. Last but not least," he added,"it is aimed at shouldering responsibility rather than'flexing muscles'. "Xi Jinping Thought on Diplomacy is the 'compass' for China's foreign policy," Liu concluded. "It demonstrates China's sincerity to join hands with other countries to create a better future for mankind. It will ensure that China takes the right side of history and its interactions with the world heads in the right direction."